This couple decided they would take their birth announcement video to the next level with a hysterical recreation of the iconic scene from The Lion King! No parent will ever forget the day their child was born. It's an unforgettable experience that you'll cherish each and every day for the rest of your life. Because of the significance of moments like this, it's understandable that you'd have a video or two to help relive the big day. Timilehin and Maria Wusu, however, took their video to the next level! The couple decided they would announce the birth of their son, Kaiori, in the form of an homage to Disney's The Lion King. Set to the tune of "The Circle of Life," the birth announcement video has been going viral! The video (bottom of page) is pretty much a shot for shot remake of the first few minutes of the animated Disney classic. Though Rafiki wasn't around to mark the young cub's forehead like the iconic scene from the movie, Dad was more than happy to oblige. 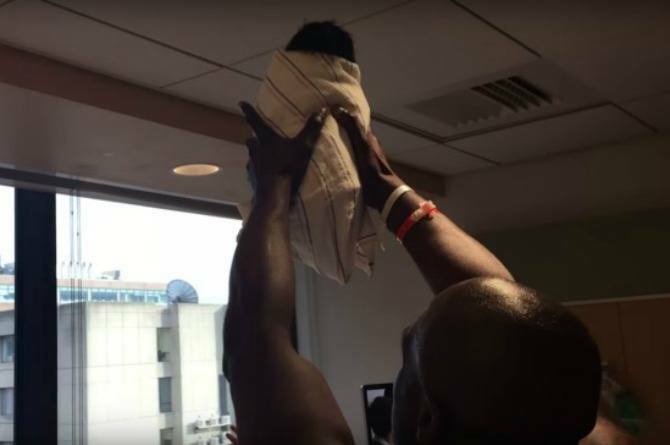 Here we see Timilehin proudly hoisting his newborn son to the world! Behold, the prince has arrived! The animal kingdom wasn't around to celebrate the birth of baby Kaiori, but the staff at the hospital did a great job in their place. The nurses and staff helped to hilariously recreate the opening scene, and did it wonderfully! There's no denying this family's excitement for the birth of their son—especially Dad! We couldn't be happier for the couple, or more thankful for their sharing of this hysterical video. We wish nothing but hakuna matata for Kaiori and his awesome parents!